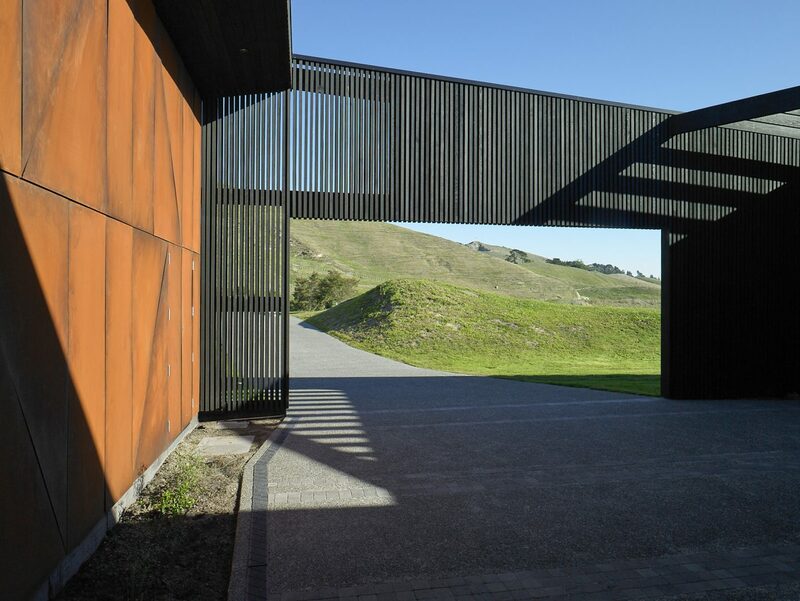 The house sits on a promontory amongst the foothills of Te Mata Peak overlooking Hawkes Bay. Our clients had run a sheep station at Parongahau for many years and were looking to establish a new home at Te Mata. 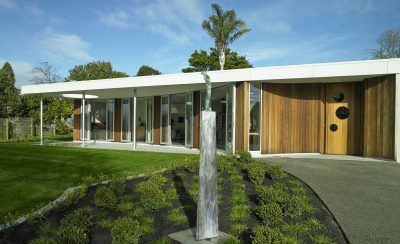 They are also actively involved in the Hawkes Bay art scene, as collectors and administrators. Our architectural response was to create a contemporary home that was infused with a sense of the region and the personal history of the family. 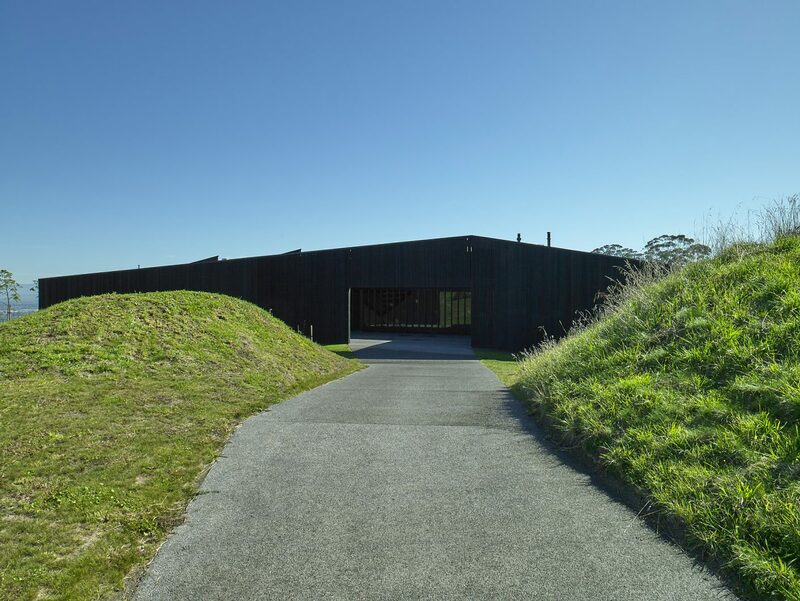 The design comprises three elongated wool shed forms laid askew across the site and connected by wedge shaped gallery spaces creating forced perspective views into the landscape. A series of triangular skylights echo the rocky outcrops on the peak above, capturing the morning sunlight. 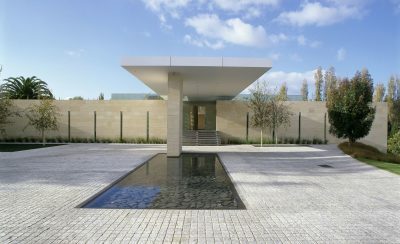 Two courtyards, a motor court and a central courtyard, are hollowed from the shed forms to create an interlocking sequence of indoor and outdoor spaces. 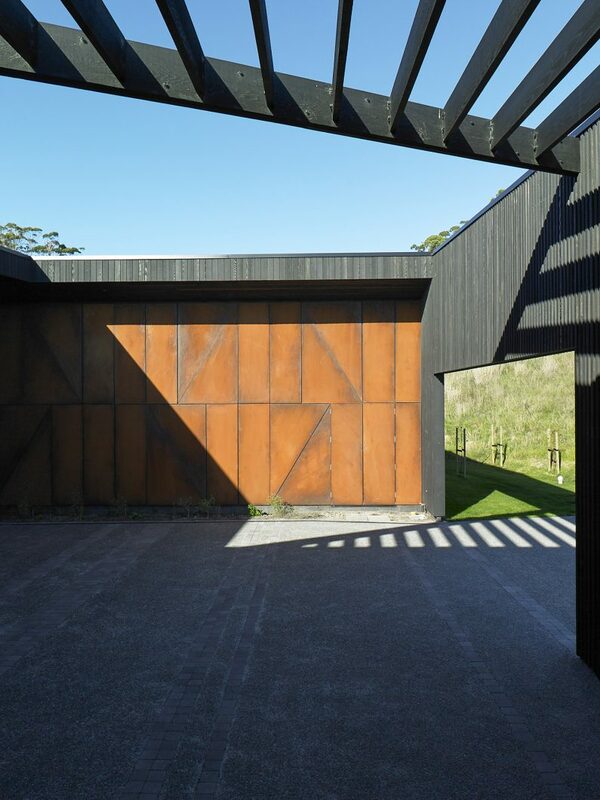 Rough black stained timber boards are combined with natural timber joinery, polished concrete and rusting steel walls to create an earthy integrity. The robust rural quality of the exterior gives way to an atmosphere of tranquillity and lightness on the interior. There is a particular focus on the framing of specific views into the landscape and the harnessing of natural light throughout the day. We were interested in creating an architecture which is both formally and spatially innovative yet deeply rooted in place and history. The house, although highly tuned to the landscape, also acts as a stage which dramatises daily life.